Dandelion is a nutritive herb. The roots and leaves of dandelion contain vitamins A, C, D, E, K, and B complex, as well as minerals such as potassium, calcium, and iron. Dandelion has diuretic effects. It also supports the liver and gallbladder. In addition, it has anti-inflammatory properties. 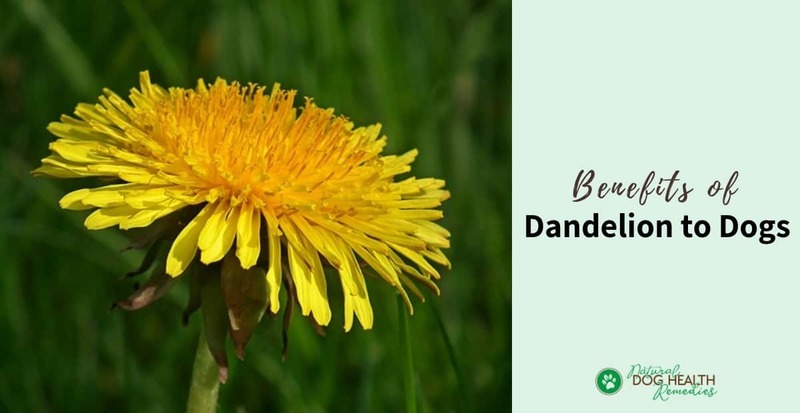 Since this herb is rich in vitamins and minerals, dandelion helps dogs to stay healthy. The herb can be fed to your dog on a regular basis as a health tonic. Specifically, dandelion benefits the liver, skin, kidneys, urinary tract, as well as the digestive and circulatory systems. Simply dry the greens and crumble them onto your dog's food. Alternatively, make a leaf tea by boiling the greens in unsalted vegetable or meat broth. (Dosage: One teaspoon of dried herb for each 20 pounds of body weight.) You can also make a juice using dandelion and carrots (see below). Dandelion is a strong but safe diuretic. Therefore, it is beneficial to dogs with heart problems, which very often cause an accumulation of fluids throughout the body. The good thing of dandelion is, it is rich in potassium, which replenishes the precious mineral lost in the urine. The diuretic property of dandelion also makes it an effective herb for dogs with UTIs. It can help with an increase in urine flow, thereby flushing out and eliminating the bacteria that are causing the infection. To this end, treat an early UTI with dandelion and also Oregon grape (which is anti-bacterial). Give 1-3 drops of the tincture of dandelion and Oregon grape orally to the dog, 5-6 times a day. Continue until the dog starts to have normal urine flow. Then reduce the dosage to once a day, 3 times a week for 3 weeks. Dandelion root supports the liver and has the ability to stimulate bile production by more than 50 percent, and it also increases bile flow to the gallbladder. This proves to be helpful to dogs suffering from liver congestion, gallstones, and other forms of liver problems. Dogs (especially older dogs) with sluggish digestive systems can benefit from dandelion since it supports the digestive system. The flowers are high in lecithin and have useful pain reducing qualities, so it can be used as a mild painkiller. The flowers can be dried and then sprinkled on the dog's food. This juice can be fed to dogs to improve their digestion and skin conditions, as well as to support the urinary tract and cleanse the blood. Use equal proportions of dandelion leaves and/or roots and carrots and make a juice using a juicer. Add a few drops of the juice to your dog's food to make her get used to the taste, and gradually increase the dosage to 1 teaspoon per 20 pounds of body weight per day. Is Dandelion Safe for Dogs? The plant itself is safe for dogs but make sure that the plants you use are free from herbicide.